Palestinian-American Muslim. Medical Student. Humanitarian. 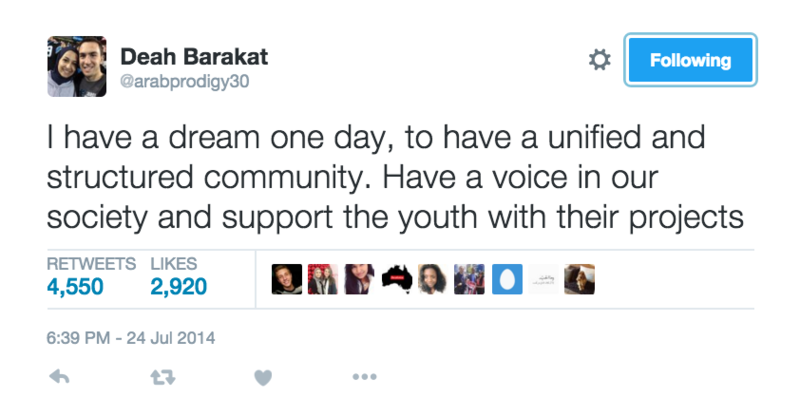 One year after The Chapel Hill shooting, I wake up still feeling like I just lost a friend. No, it's more than that. A best friend. No, a sibling. No, three siblings. On February 10, 2015 the world lost three people so amazing that words would fill oceans before they could even begin to describe how great Our Three Winners were. On this tragic day, the heavens screamed as three angels were killed. But on this very same day, a legacy was born. A legacy of love, inspiration, hope, joy, and every other positive noun our dictionaries ululate in their memory. A legacy which reminds us that Our Three Winners are still here because their legacy can't be silenced by hate. 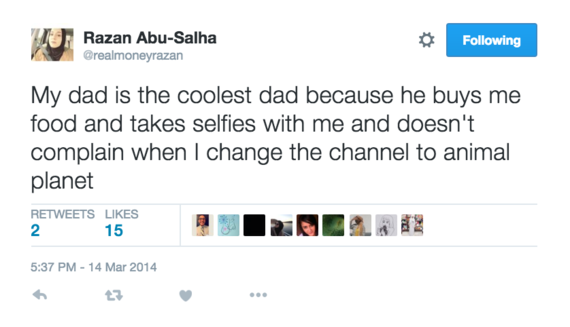 When we would go shopping, Razan would occasionally see something that reminded her of someone and she'd buy it for them without thinking twice. One time, she found this mug that she knew her dad would love. So she bought it, wrote a cute note on a napkin, and placed them both on the kitchen counter for her dad to see when he got home from work that day. It wasn't his birthday, or Father's day, or anything special. It was simply a small gesture of kindness, one that meant the world to her father. Razan taught me that the greatness in a gift lies in the thought behind it rather than it's value, and that sometimes, it's the littlest acts of kindness that mean the most. 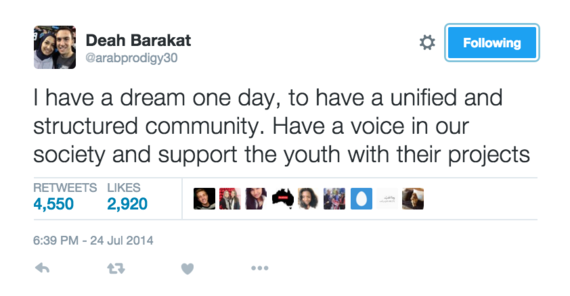 One of the most endearing qualities that my dear friend Deah Barakat possessed was his giving nature. He never lost the opportunity to give to those around him and make their lives better. I remember distinctly one day when Deah and a group of our friends were eating at Char-Grill in downtown Raleigh. We were joking around over lunch, like we usually did, when Deah spotted a homeless man sitting under the shade of a tree. While this poor man did not register on the rest of our radars, Deah quietly got up from the table, bought a meal, and walked over to hand it to the man. The man was taken aback by this moment of kindness and thanked Deah profusely. This is just one tiny incident that portrayed just how giving of a soul Deah was. Deah taught me that we are best defined by how we treat those who can do nothing for us and to never look down on someone unless we are helping them back up. 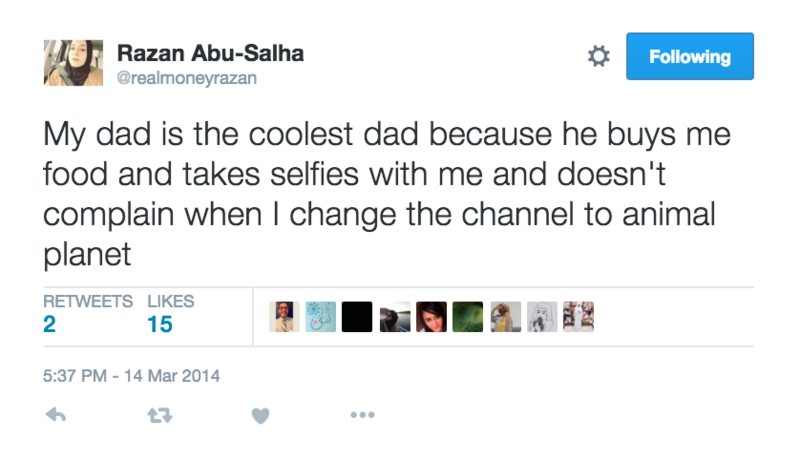 One of the things I loved the most about Razan was her amazing sense of humor. She used to always share funny things she had found online and I would reply with the same. It was a nightly ritual before we went to sleep and I always looked forward to it. It'd make bad days end with great nights. 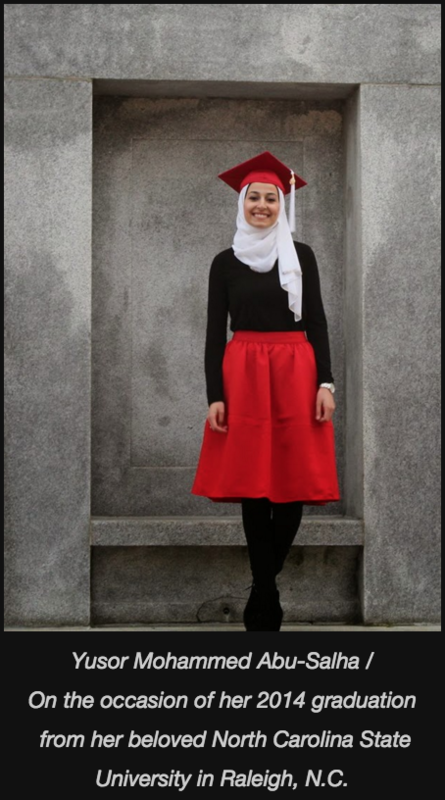 From her personality to her social media profiles, Razan was the type of person to make your diaphragm ache from laughter. Razan taught me to be a source of light in a world of darkness and that a good laugh can heal a lot of hurt. I can't count the number of times I wanted to quit doing something after feeling discouraged and Razan would motivate me to keep at it. The afternoon of her death, we were texting around 3PM. I had just received a test grade that was really disappointing and I was telling Razan how I was reconsidering my entire career goals because I studied so hard for this exam yet still did not do well. She told me to keep working towards what I am passionate about and to never give up. This was the last thing she ever told me. Not a day goes by where this doesn't motivate me during hard times. Razan taught me that the best things in life don't come easy, that success is always sweeter when preceded by struggle, and that the only place where success comes before work is in the dictionary. 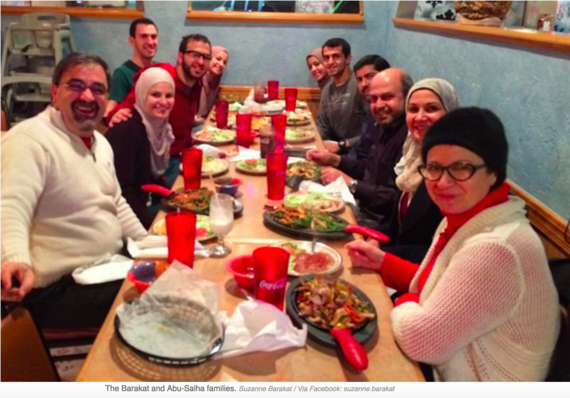 I have not met anyone who has exemplified what is means to be true American Muslim better than Yusor, Deah, and Razan did. They were admirable examples of how we all should contribute to our American society and how to be the best neighbor and citizen that we can be. "Growing up in America has been such a blessing. And although in some ways I do stand out, such as the hijab I wear on my head, the head covering, there are still so many ways that I feel so embedded in the fabric that is, you know, our culture. And that's the beautiful thing here, is that it doesn't matter where you come from. There's so many different people from so many different places, of different backgrounds and religions -- but here we're all one, one culture. And it's beautiful to see people of different areas interacting, and being family. Being, you know, one community." Yusor motivates me to be the best person I can be, to be proud of who I am, and to embrace the diversity around me. 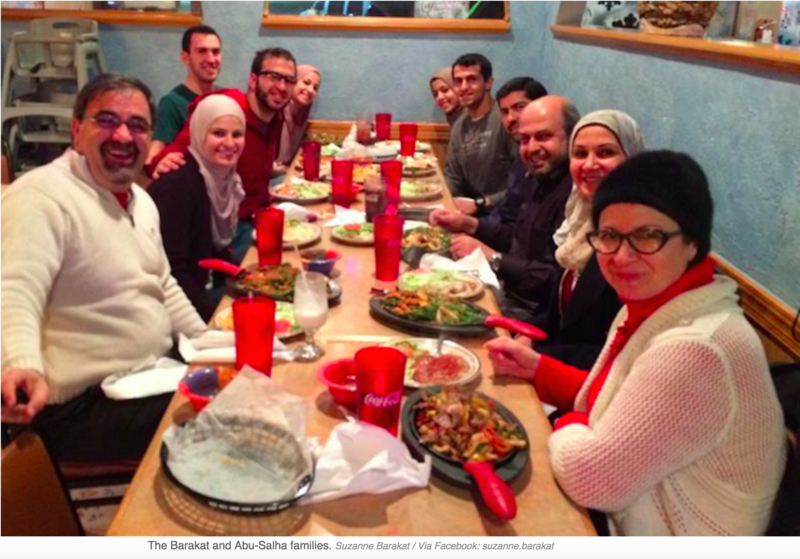 Each year, the Barakat family would host a huge feast for everyone during the month of Ramadan. You didn't have to be Muslim to attend, it was an open invite. One year, Yusor and I were doing a welcome information session for a foreign exchange program we were involved with at NCSU. We realized that since most of the students were away from their families, and they probably didn't have anywhere to eat a home cooked meal. Knowing this, Yusor decided we contact everyone we knew so that we could get all these students rides to the Iftar at the Barakat house. 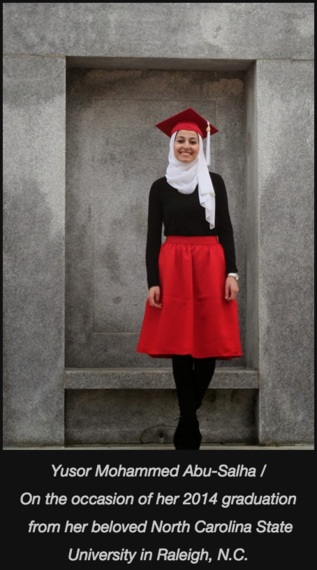 We didn't know these students that well and they were really different than us, both ethnically and culturally, but this didn't matter to Yusor. She cared unconditionally for everyone and would go out of her way to comfort people. Yusor taught me the importance of being welcoming to others, to find the beauty in our differences rather than letting it separate us, and that love will always overpower hate. There are millions of refugees who have split oceans looking for a home in the U.S. to replace the one they had lost, and Yusor reminds me everyday that treating the refugees as a problem IS the problem. We must do everything we can to help those in need, no matter how different they look. 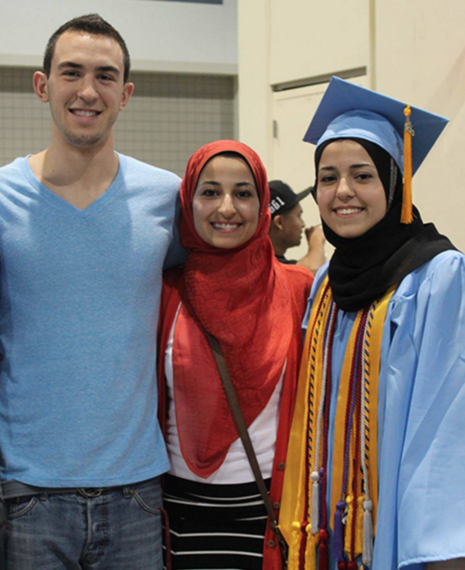 Deah, Yusor, and Razan were good to those they loved. They made sure to devote time to their families no matter what. Although Deah's sister, Suzanne, lives in California, they still maintained a really close relationship. And although Razan and Yusor's brother, Yousef, lived all the way in Antigua they always kept in close contact and made sure to spend time with him when he visited. 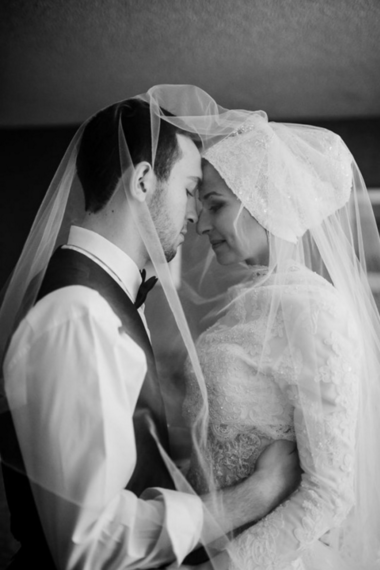 Razan and Yusor were inseparable, they both respected and cared for each other so much. Beyond that, the relationships all three of them had with their parents were admirable. They were caring and they expressed the love they had for their families so openly. One thing I remember about Deah is how he was always there whenever his parents needed him. There were quite a few times when we would be in the middle of a basketball game and Deah would leave earlier than expected to go help his mom at home or his dad at work. Deah, Yusor, and Razan taught me that family is more than a six-letter word we use to justify talking back to our parents or fighting with our siblings. They taught me that just as each letter is essential in forming this word, so is each member of a family. Love your parents, hug your siblings, kiss your children, because you never know when you may lose them. Deah protected his family till the end. They were his heart and he was their armor. 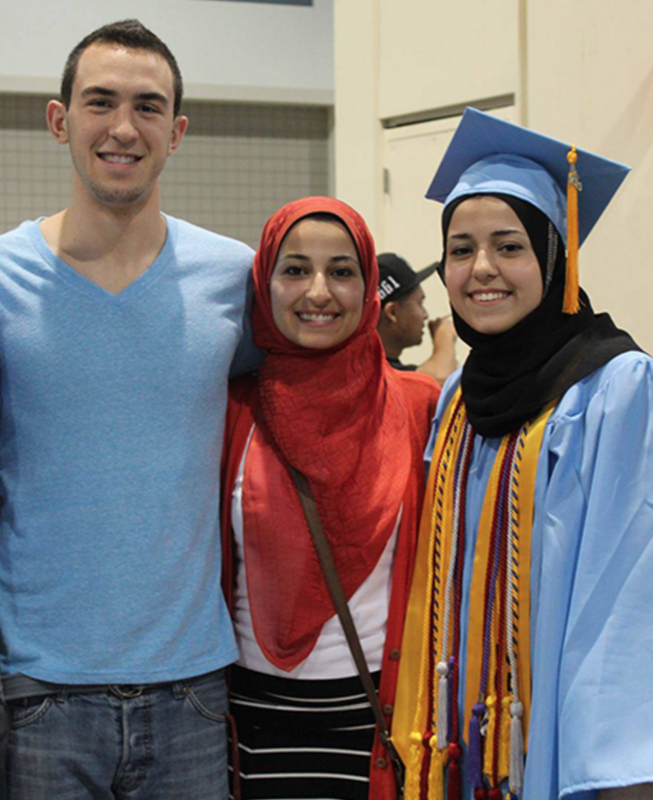 He loved Yusor and Razan more than any of us can even express. 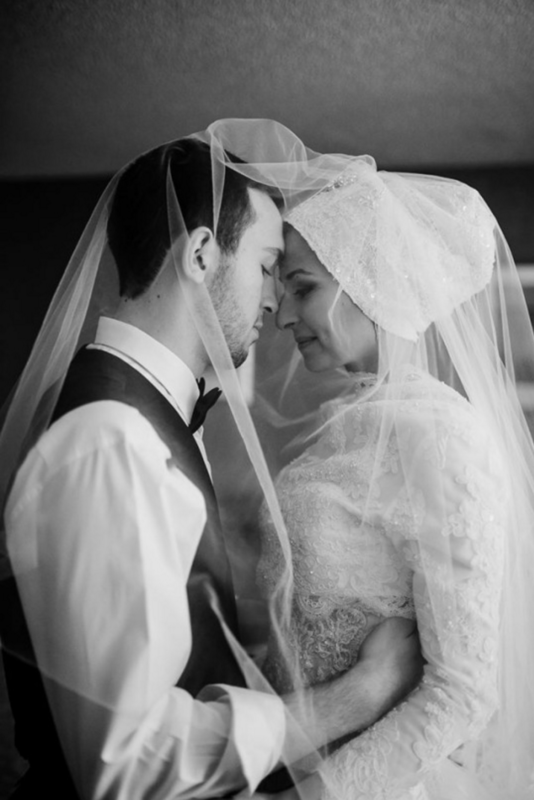 Deah and Yusor were the most perfect couple I have seen. It is very rare that you look at two people and the lights within their souls reflect on everything around them. I still remember the first time I met Yusor at my friend's birthday dinner. Deah was so loving and affectionate towards her. That love and affection was even more evident on their wedding day. I have never seen Deah that happy in my life. He looked to her on the stage with a gaze of complete and utter adoration. Deah and Yusor's bond was the kind you saw in movies, the kind that is so deep it's hard to believe that it exists in real life. I still remember the way Deah would tease Yusor, and she would laugh and say his name but it would just sound like Deaahahaha (sounds cuter when she did it). 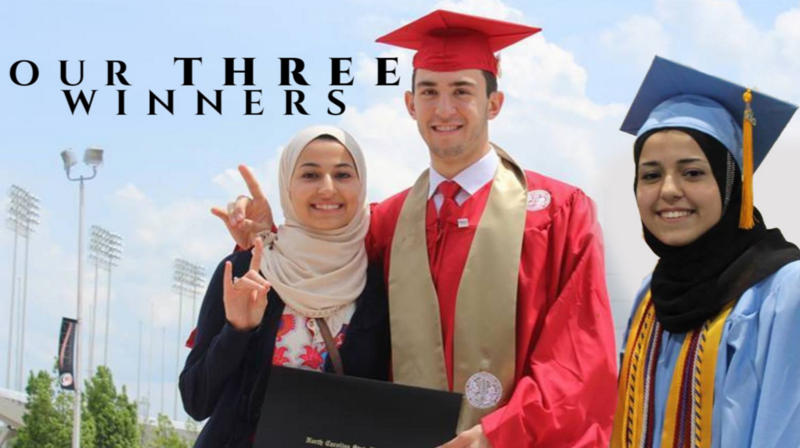 Yusor, Deah, and Razan each loved to serve others, in both our local community as well as across the world. They did whatever they could to help others and stand up for justice, not for the praise, but because of the joy and satisfaction they felt in seeing the smiles of the people they helped. 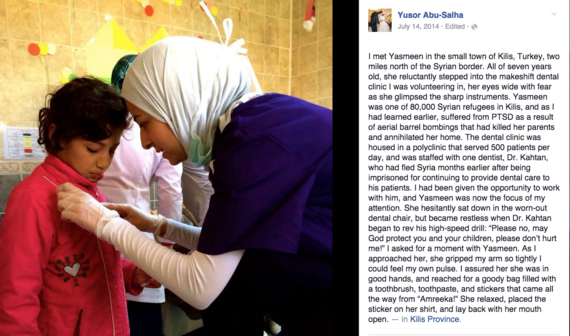 I used to see Yusor at every fundraising or community event I attended. Before her passing, she was helping me plan a Health Fair for the low-income and marginalized members of our community. 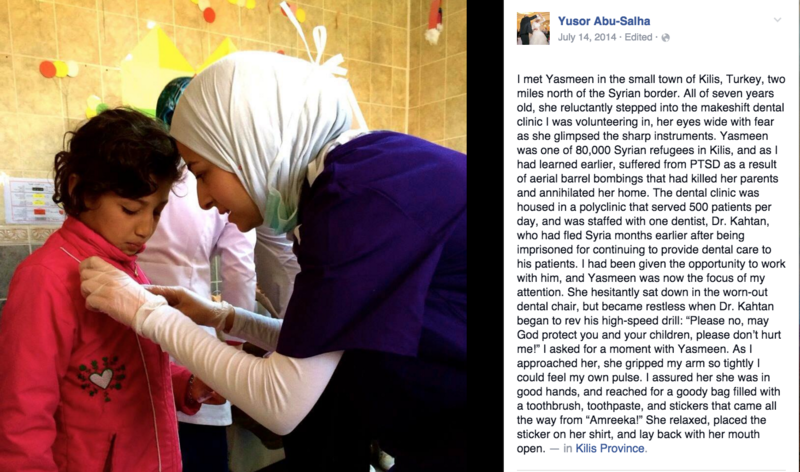 Yusor used to help in every event she possibly could locally, and she even collected dental supplies from the community to take to refugee camps in Turkey with her mom. Razan led a project that consisted of providing food and other supplies to homeless people in the downtown area. These are the types of things they did that spoke volumes about them after their deaths. While in dental school, Deah decided he wanted to help provide dental care to the Syrian refugees, a people who had for the most part been forgotten. He knew exactly what he wanted to do so he set out to do it. He set a goal of $20,000, which would allow him to buy the dental supplies he needed and take a group of volunteers with him to help overseas. 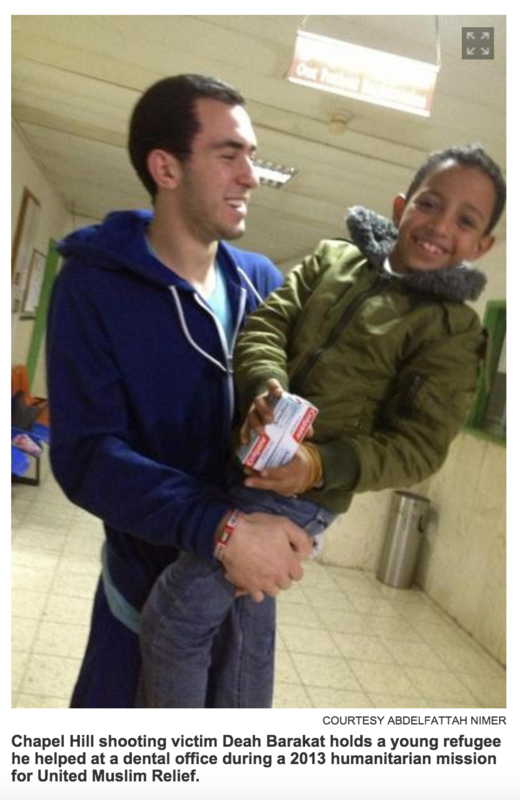 He called it "Project Refugee Smiles". Deah had big goals in mind and even a bigger heart. When his dad told him "You have long way to go, my friend", Deah responded saying, "Dad, I'm going to try. I'm going to give it my best." 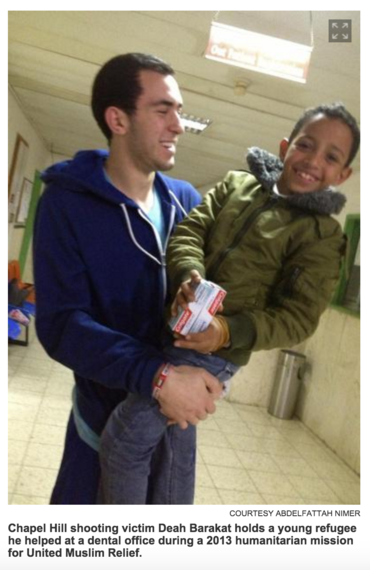 By the time he was killed, Deah had already raised $16,000 for Project Reufgee Smiles. Deah taught me that every single person has the ability to make a difference in the world, it just takes passion and determination. He never raised the $20,000. He raised over $500,000. I am Deah Barakat. I am Yusor Abu-Salha. I am Razan Abu-Salha. I am every tear wept on that tragic day and everyday since, tears that compete with rain to flood oceans. I am every ache associated with their names, each ache so powerful that it makes my body forget how to stand. As my fingers shake typing this piece, begging the keys to help me find the words to stitch sentences that would do them justice, I find comfort in one fact: We are their legacy. We are the successors of their story, the ambassadors of their mission, and the followers of their footsteps. And it is on us to continue carrying on their legacy. We must. 1. Project Lighthouse: Deah once tweeted he had a dream to inspire his community and that is exactly what this project is all about. If you would like to make his dream a reality, check out their website. 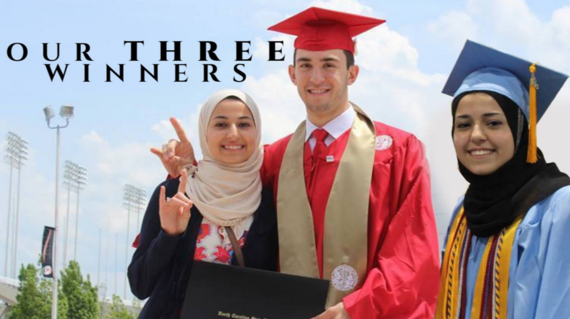 A special thanks to Asem Rahman, Doha Hindi, Hoda Abrahim, Nida Allan, Sara Dahbour, and all the friends of Our Three Winners who wished not to be named but helped put this together.